Students from SC/ST,OBC and economically weaker sections: All Free ship facilities offered by the government is made available to SC, ST, and OBC students. Students from poor economic backgrounds are provided with facilities like Fees installments, book bank facility, and free counseling facility. Students with physical disabilities: Students with physical challenges are given facilities like Eduvision laboratory, lift facility, arranging for classrooms nearer to lifts, special cubicles for writing exams, ramp at entrance, writers and extra time for completing exam papers. Overseas students: At present there are no overseas students enrolled in the college. However the college is open to the idea of admitting overseas students in future when international educational tie ups will be made. As and when overseas students join, the college will provide all necessary support including hostel facilities which are available with various religious trusts and Colleges located nearby the campus. Students to participate in various competitions/National and International: Various committees are formed to mobilize and encourage the students to participate in competition at national and international levels. The college arranges coaches to train the students and provide enough infrastructure to support them. Special doubt clearing sessions are held to help such students. Students are encouraged to participate in both co-curricular and extra-curricular activities such as NSS, NCC, sports and cultural activities. Medical assistance to students: health care, health insurance etc. : Medical facility is given to all the students and all of them are covered under Group Medical Insurance scheme. We have a panel of three doctors at our disposal to deal with any medical emergency. In addition to this, we have one medical practitioner in our staff. First Aid boxes are kept in the main administrative office, office of self financed section and in Gymkhana to meet any unforeseen medical emergencies. Organizing coaching classes for competitive exams: We have MKES Management and Research institute associated with our college which provides coaching for competitive programs like CA, CS, GRE, and CAT. Special seating and reading facility is made available in the library for the students appearing for various competitive exams. Skill development (spoken English, computer literacy, etc.,): To improve the English speaking skills among the weaker students the Department of English is organizing spoken English classes on regular basis. Spoken English classes are conducted by self finance sections as well. Tutorials of smaller batches are also being conducted regularly. College has many computers available to students as well as teachers. We also have a separate cyber area in the library with internet facility. Add-on-courses are being successfully conducted for Functional English, Travel and Tourism Management, Child Care and Child Developments well as Computer Applications. Many students enjoy the benefit of the above UGC recognized Add- On Courses introduced in our college. Support for “slow learners”: The college has introduced remedial classes for the weaker students. Mentor meetings and excellent teacher- learner communication that prevails in the campus helps to identify slow learners who are given informal assistance to improve their academic competence. During exams half an hour extra time and the facility of a writer as per the University norms is provided to slow learners. Extra hours are devoted by the faculty to help them to understand the difficult modules in the syllabus. Exposures of students to other institutions of higher learning/ corporate/ business house etc: Various workshops, talks and guest lectures are arranged by the college under the banner of career guidance and placement cell and other departments. Famous personalities and industrialists are invited regularly for guest lectures. Our students get the benefit of sharing their invaluable expertise. The college also arranges industrial visits to leading corporate houses for the practical exposure. The PG students are motivated to participate and present research papers in various national and international seminars, conferences and workshops. 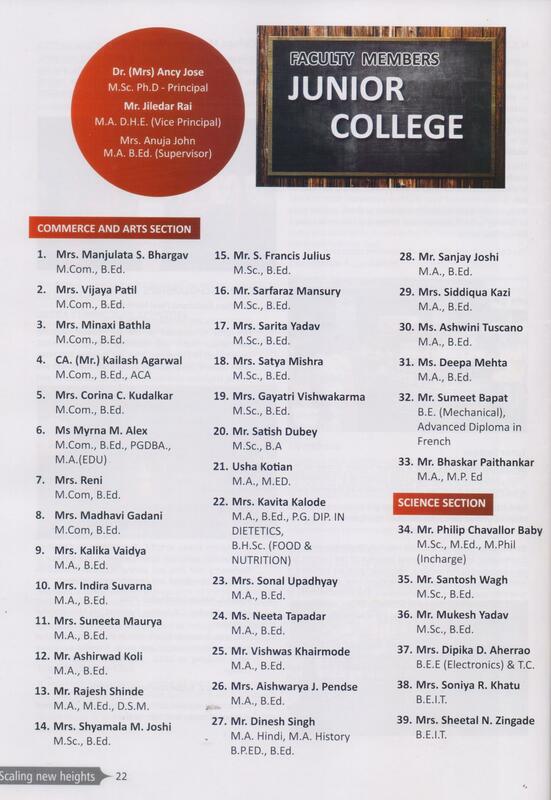 Publication of student magazines: The college encourages students to be the part of all college publications such as Khandwala Times (Quarterly), Niharika (Annually) and other research publications by Khandwala Publishing House (KPH). Their creative talents are pooled and tapped in all college publications. In fact, students are kept in the editorial teams of college publications.